A first time overnighter organization coup for our new President, Jim Boyde! 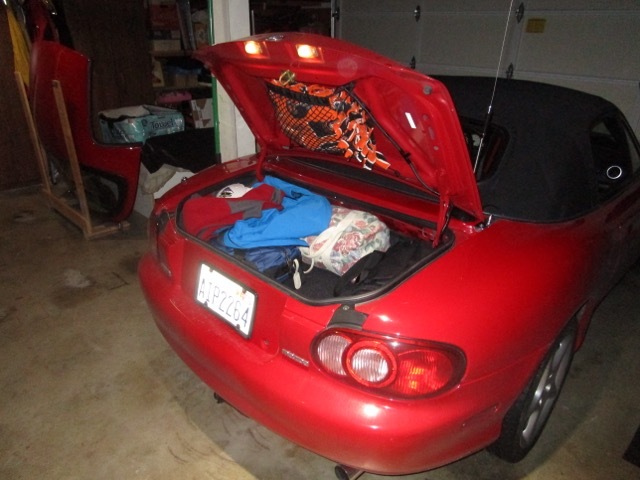 Karen and I started off by removing the hardtop and getting packed. 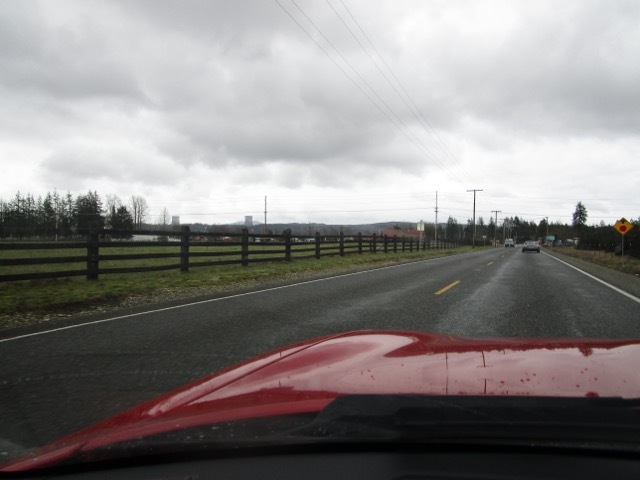 The rain on the drive to the starting point in Port Orchard was the hardest our car had ever been in. I was rethinking the hardtop removal about now. We stopped at Starbucks and hustled out of the rain. A tall this and a grande that and we headed for the meeting place. 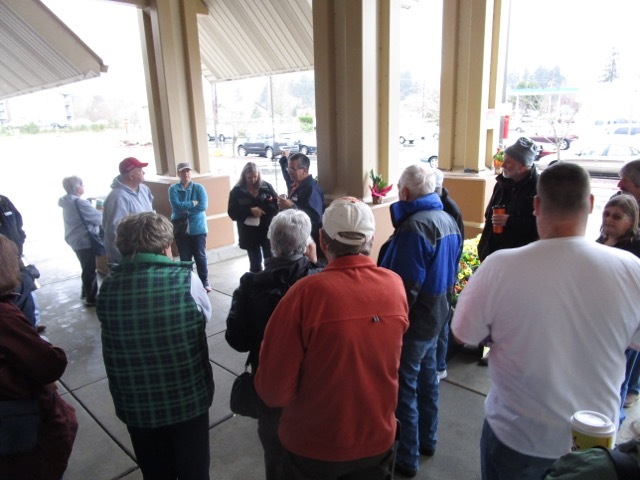 We made it to Port Orchard (named after the body of water between Bainbridge Is. 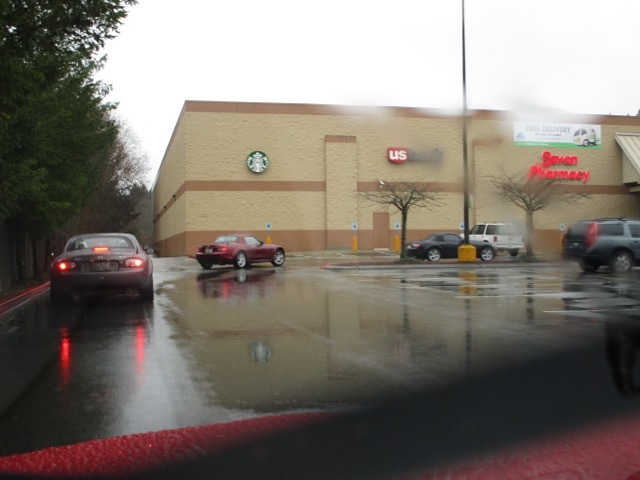 and Kitsap Peninsula) where is was still raining. 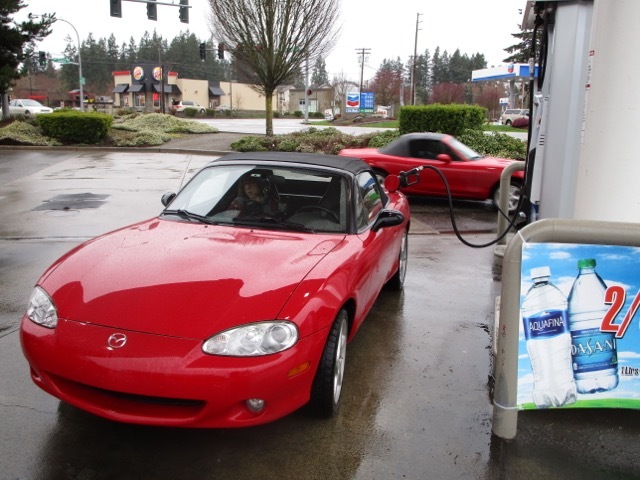 Gassed up and went looking for a parking space. 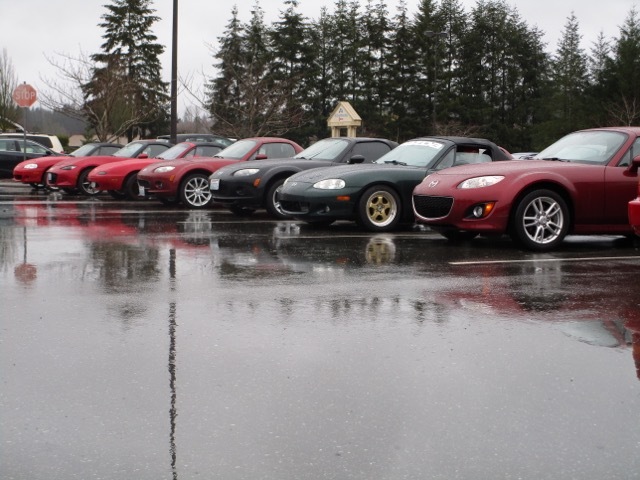 We found a bunch of other Miatas and parked in the rain next to them. We met the others and Jim decided to get the drive rolling. 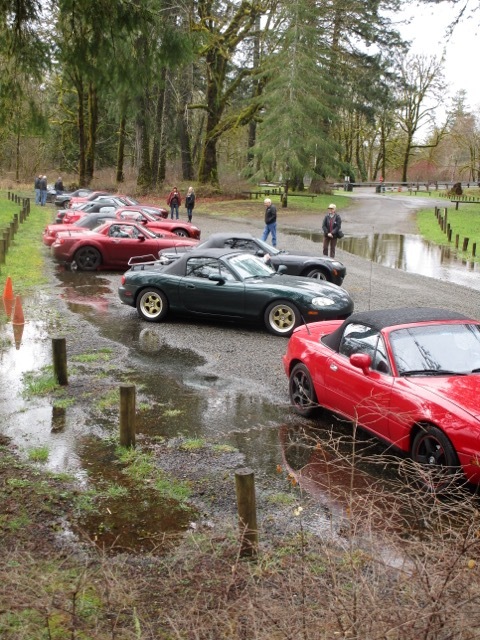 A short drivers meeting and we were driving in the rain. Heading out of the parking lot, 15 cars in tow. Jim never disappoints on his road choices. 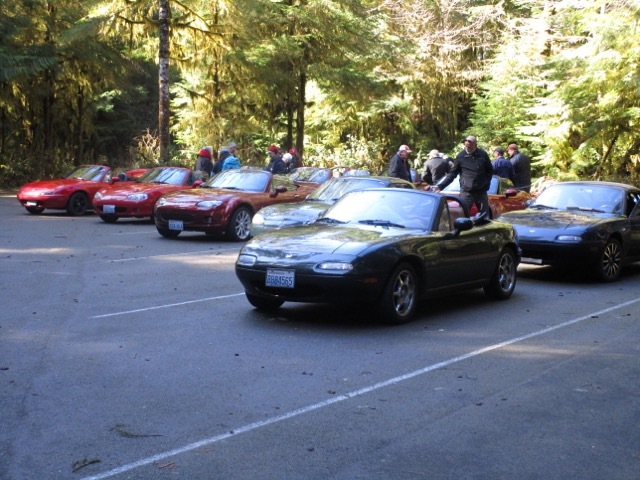 After meandering around the Belfair area, we stopped at the Twanoh State Park. 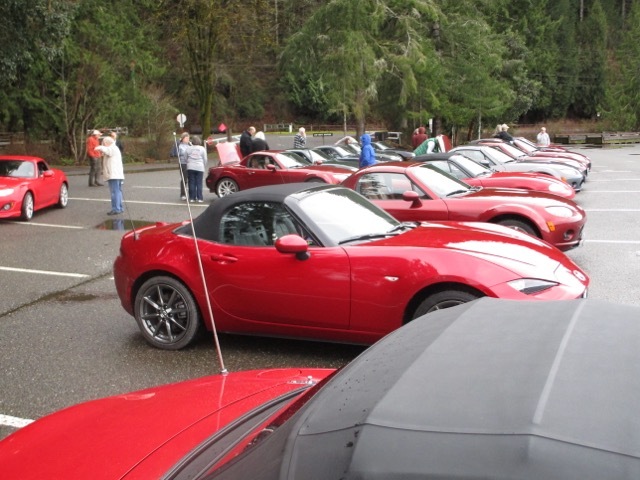 Great views and a chance to see everybody's cars. 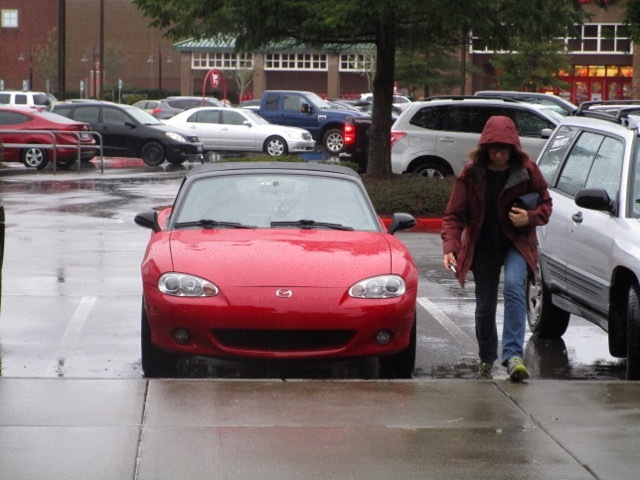 The rain has stopped, prompting a few people to drop tops. Not everyone was so brave. 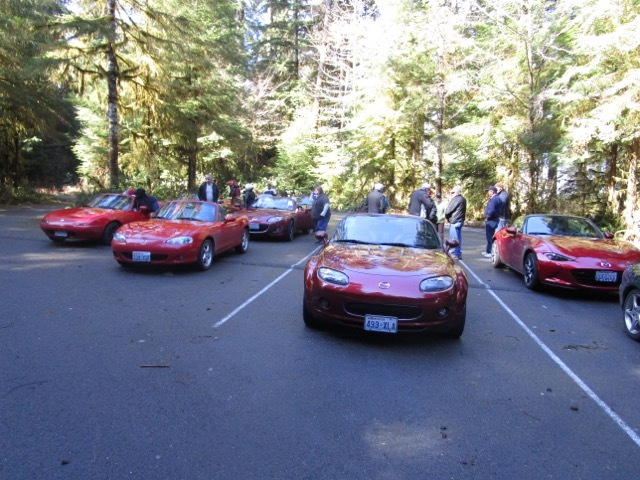 Did I mention we had a large contingent of red cars? Well, yes we did. 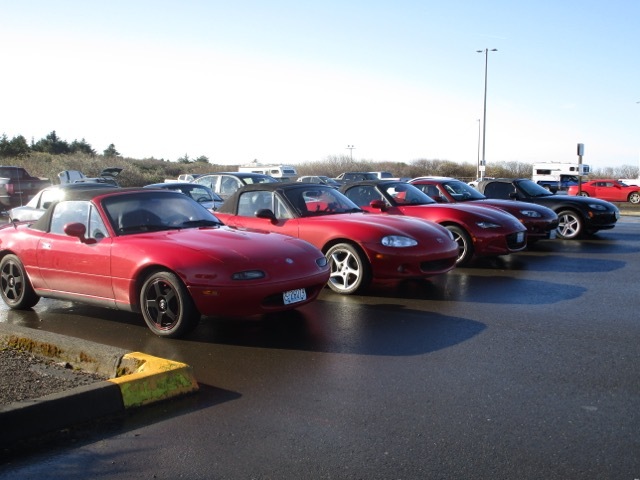 We also had multiple NA's, NB's, NC's and one Soul Red ND. A super nice turnout. 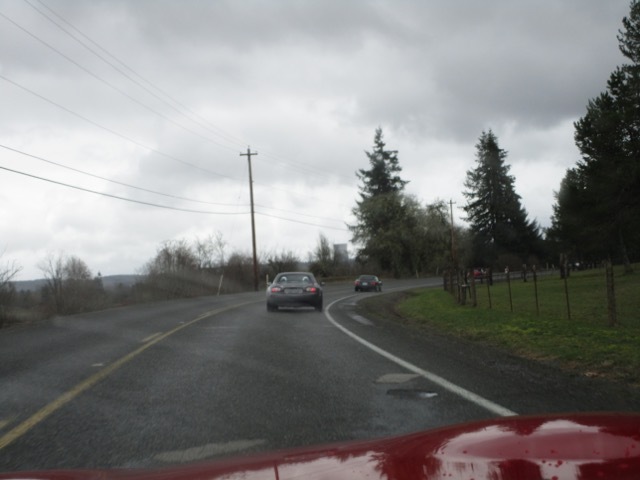 More fine roads such as the Satsop Cloquallum Road that Jim somehow has in his backpocket. 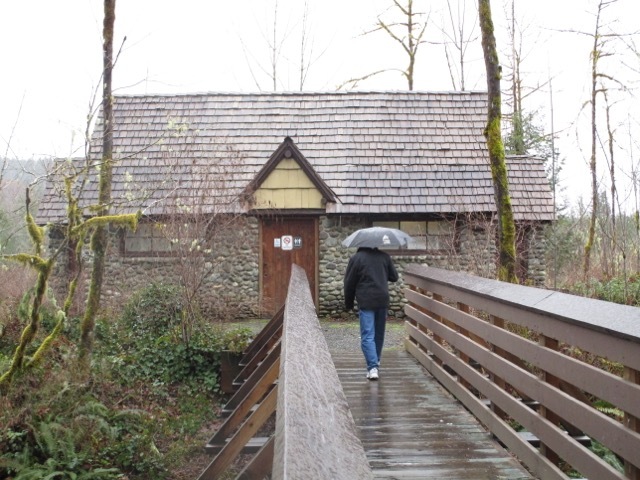 We found another rest stop with a cute little outhouse--Schafer State Park. This park was just about completely underwater. I guess the East Fork of the Satsop was a little too high for its edges. At this point people were starting to get hungry. 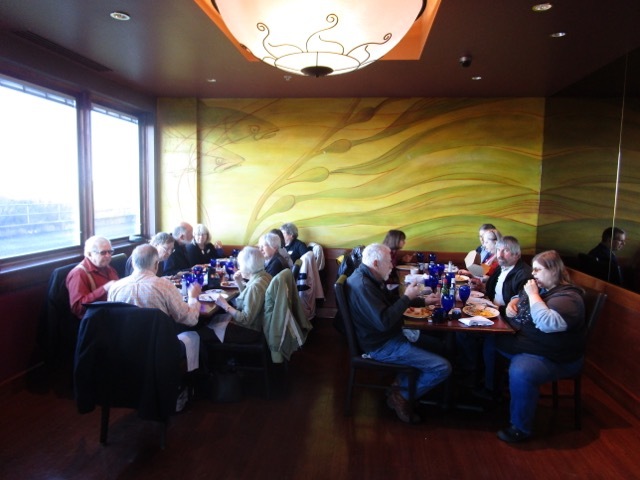 But no sooner had we hit some more fantastic roads we came to Montesano and a restaurant called the Fishin' Hole. 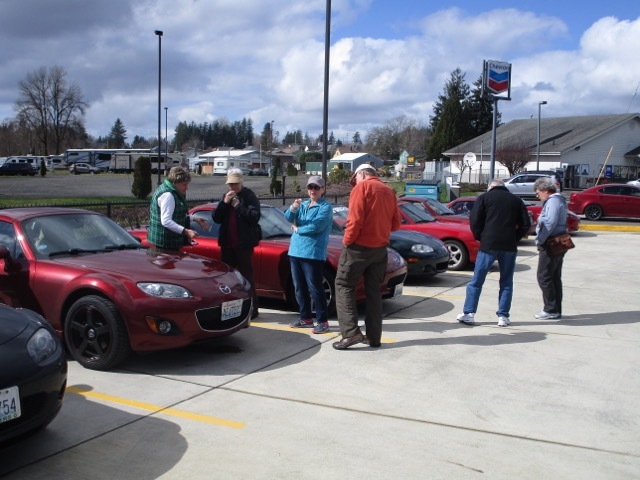 The rain decided we had had enough so the sun poked through and most (except those pesky hardtop folks) considered putting their tops down. 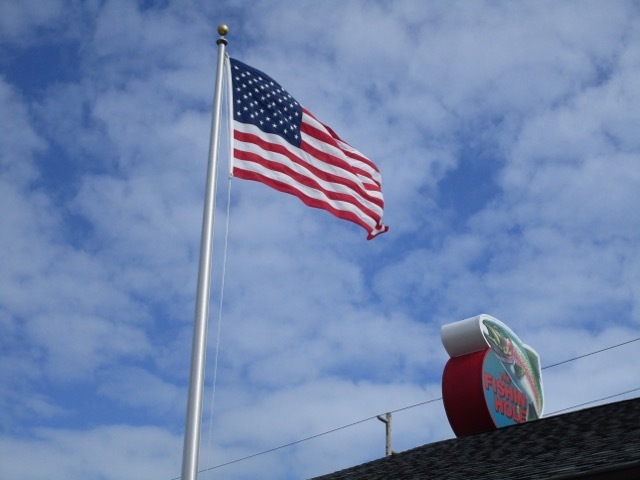 On the road toward Ocean Shores we passed through Hoquiam and made a beeline for the Shilo Inn. 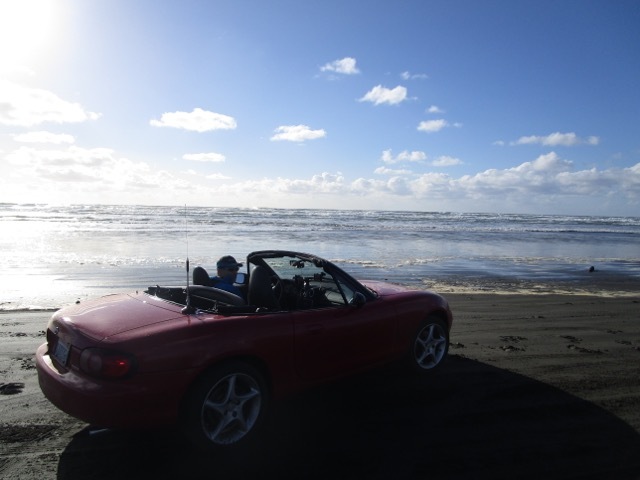 After settling in some people in the club suggested a drive on the beach. After a few highjinks on the sand, Karen and I retired to our spacious suite. It had three TV's a king bed, couch, etc and a great view from the balcony. Next morning was a breakfast at the casino. 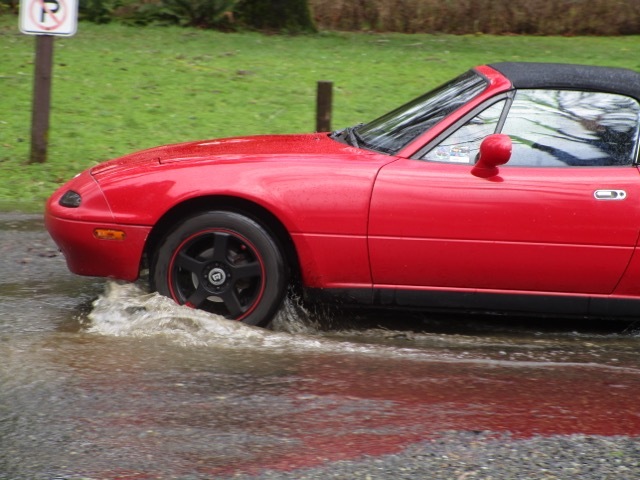 On the road by 10:30 and a great drive up the coast to Lake Quinault, Forks and finally Lake Crescent. K and I doubled back from Lake Q. to make an easier drive back to the eastside. The rest took off up north. 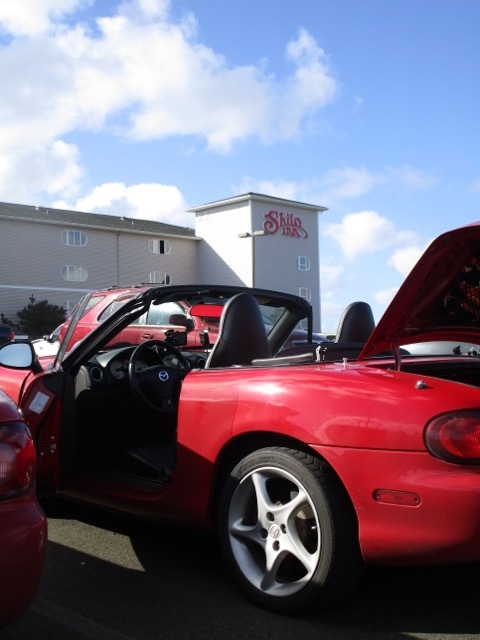 First time visitors to Ocean Shores for Karen and I. 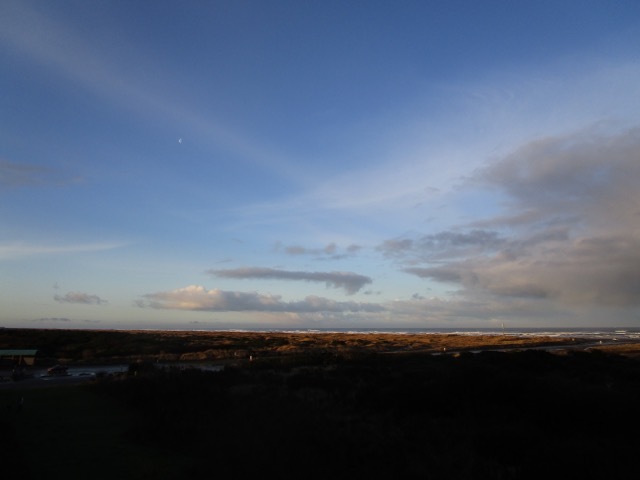 Thank you Jim and Carla for a wonderful weekend. This has the start of a fine tradition!